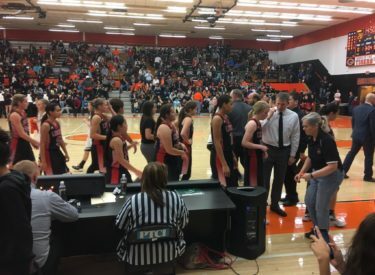 After losing six of the past seven against Guymon, Liberal left no doubt Tuesday night in front of a big Guymon crowd. Liberal won 48-28 after building a lead of 40-18. LHS snaps a four game losing skid against Guymon. Jada Mickens scored 11 to lead Liberal. Liberal jumped to a 14-0 lead and led 16-4 after one quarter and 27-13 at the half. LHS forced 22 Guymon turnovers with their 1-3-1 full court press. Megan Bellar led the Lady Tigers in their opener with 10. The Lady Redskins are 2-0 for the first time since the 2008-09 season when LHS went 21-2. LHS hosts Hereford Thursday night at 6 as part of the Conestoga/Community Bank Classic. Redskin Pre-game begins at 5:45 in the Big House on 1270 and kscbnews.net.